US, 1953, 72 minutes, Black and white. Debbie Reynolds, Bobby Van, Bob Fosse, Barbara Ruick, Hanley Stafford, Lurene Tuttle, Hans Conried, Kathleen Freeman, Almira Sessions. 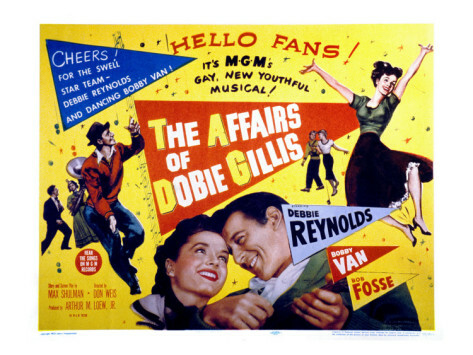 The Affairs of Dobie Gillis is a small-budget supporting feature from MGM in the early 1950s. It made many of these programmers to go with their more spectacular main features. It also gave an opportunity for some of their contract stars to make appearances and give some boost to these films. This is a Debbie Reynolds feature, after her success in Singin’ in the Rain. The film is interesting for historical reasons rather than entertainment – the 1950s of this kind of story seem very remote. They were based on stories by Max Shulman who wrote the screenplay for the film – and they were later the subject of a television series. Looking at the lifestyle of the 1950s, especially at college, with its restrictions – but the students wanting to break out, and comparing it with, say, the slasher films or the spring break kinds of films from the 1980s on, things changed a lot during thirty years. Maybe the motivations of the students of the 1950s were not all that different from those of the 1980s, but there were restrictions. Debbie Reynolds gives a very vigorous performance, reprising the song Good Morning which was so successful in Singin’ in the Rain. Dobie Gillis is played by Bobby Van, a singer and a dancer who appeared in a number of films and television but came at the tail end of MGM musicals. However, his friend is played by Bob Fosse – and this is one of the reasons for seeing the film. It came out the same year as Kiss Me Kate which Bob Fosse helped to choreograph as well as star in. His distinctive kind of dancing is very much to the fore in an episode in this film. Barbara Ruick who portrays the fourth of the quartet is a lively singer and dancer and actress. There are interesting supporting roles including Hans Conried (The 5000 Fingers of Dr T) as a prissy English professor. Kathleen Freeman, a veteran of many films and comedies, appears as the leader of an all-women’s band, Happy Stella Kowalski (in honour of A Streetcar Named Desire). Debbie Reynolds’ aunt is played by Almira Sessions, not a well-known name, but her face is familiar from many similar roles over many decades. The film was directed by Don Weis, who made such films as I Love Melvin and Confidentially Connie at this time. The film offers characters and young people from the 1950s, the strictures of a father, the more benign attitude of a mother, the presentation of staff at school, the role of music and bands in the life of young people at that time.